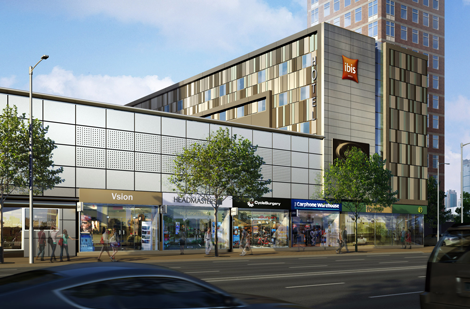 Accor is to open an Ibis hotel housed within a converted office block at the West 12 shopping centre, located next to London’s Shepherd’s Bush underground station. The four-storey, 128-room property is part of a “major transformation” of West 12, which will also see shops at the front of the centre refurbished. The hotel will be one of the first in the UK to bear the new Ibis branding (see online news September 13, 2011), and will feature “a contemporary design, including a bar”. The property is set to open this year, with Accor’s managing director UK and Ireland Thomas Dubaere calling it “an important opening in an important year”. Situated on Shepherd’s Bush Green, West 12 features nearly 300,000 square feet of retail and leisure space, including a 12-screen cinema, a Fitness First gym, and a Morrisons supermarket. The shopping centre is located opposite Shepherd’s Bush underground station, connected to both the Central line and London Overground network. For more information visit accorhotels.com, west12shopping.co.uk.